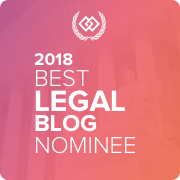 Food Law Latest has Been Nominated for The Expert Institute’s Best Legal Blog Contest, in the category Niche and Specialty Blog! The process take just 2 minutes and I will be extremely grateful if you will contribute. From a field of hundreds of potential nominees, Food Law Latest has received enough nominations to join the one of the largest competitions for legal blog writing online today. Now that the blogs have been nominated and placed into their respective categories, it is up to their readers to select the very best. With an open voting format that allows participants one vote per blog, the competition will be a true test of the dedication of each blog’s existing readers, while also giving up-and-coming players in the legal blogging space exposure to a wider audience. Each blog will compete for rank within its category, while the three blogs that receive the most votes in any category will be crowned overall winners. The competition will run until 12:00 AM on December 17th, at which point the votes will be tallied and the winners announced. Founded in 2011, The Expert Institute is a technology-driven platform for connecting qualified experts in every field with lawyers, investment firms, and journalists looking for technical expertise and guidance. The Expert Institute combines a vast database of pre-screened experts with a talented case management team capable of custom recruiting experts to fit the specific needs of our clients. The Expert Institute also maintains one of the internet’s most visited blogs on expert witnesses, in addition to an extensive case study archive and expert witness resource center. The best food safety blog for me and I am willing to spread knowledge and information with pleasure. Thanks Veselina. You readers are the best sponsor!